CM J. Jayalalithaa has drawn up an ambitious plan for infrastructure development in the next decade at an estimated outlay of Rs 15 lakh crore. The plan includes a Rs 20,000-crore Greenfield airport near Chennai, Rs 50,000-crore ultra mega power projects, Rs 4,000 crore for two medi-cities and a Rs 1,20,000-crore high-speed passenger rail link. 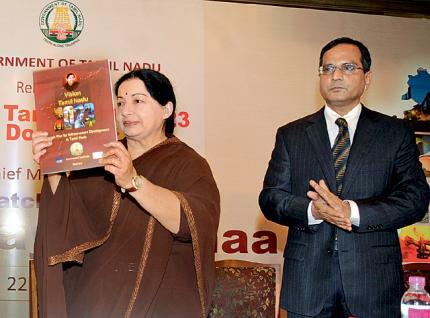 Releasing ‘Vision Tamil Nadu 2023’, CM said the document articulated her dream of making TN numero uno on all economic and social indicators. “I will not rest till I realise my dream outlined in this document. I invite you all [industrialists] to participate in making it a reality,” she said. Ms Jayalalithaa said the present annual capital expenditure of the state government was Rs 14,000 crore and even with future increase it could not be expected to contribute more than one-third of the required investment. As such, she said, a substantial portion of financing for infrastructure had to be mobilised from non-governmental sources such as private sector organisations, banks and FDI. Envisaging a slum-free society with access to piped and pressurised water and safe sanitation facilities to all citizens of the state, chief minister J. Jayalalithaa on Thursday noted that nobody in Tamil Nadu would be left behind. “There will be no poverty. No person in the state will be deprived of any basic need such as food, clothing and shelter and any resident who seeks employment will be able to find a gainful and productive employment commensurate to his/her capabilities,” she noted in the Vision 2023 document released by the state government here on Thursday. She said the government would provide the necessary helping hand in terms of income support, food, shelter and healthcare to the old, helpless and destitute through its social security net, so that there is no fundamental deprivation at any level in the state. Stressing that open defecation will be completely eliminated in the state, she said her vision is to create a slum-free and hut-free Tamil Nadu constructing 25 lakh affordable houses for the poor and achieve universal secondary education. The chief minister said the Vision 2023 would make Tamil Nadu to numero one in the country where its people enjoy all the basic services of a modern society and live in harmonious engagement with the environment and with the rest of the world. “We will aim at increasing the gross state domestic product (GSDP) at a growth rate of 11 per cent or more per annum over the next 11 years,” she said adding that the state had already clocked an impressive growth rate of 13.95 per cent in 2005-06 and the manufacturing sector registered an all time high growth rate of 15.10 per cent. “Although this growth momentum decelerated in subsequent years, there is no reason to believe that we cannot reclaim the high growth path,” she noted. Chennai is sure to match some prominent international destinations if some of the ambitious projects envisaged by chief minister Jayalalithaa in her vision document transforms into a reality. The Rs 15 lakh crore total estimated investment in infrastructure should perhaps be an indicator of what the CM holds for TN in future. The most notable among them would be allocation of 30 (Rs 4.5 lakh crore) and nearly 25 (Rs 3.8 lakh crore) percentage of the total estimate for energy and transport sectors respectively. As per the document, the CM hopes create high-speed passenger rail link connecting Chennai, Coimbatore, Madurai and Kanyakumari at a cost of Rs 1.2 lakh crore and another Rs 60,000 crore for metro and monorail networks in TN. The CM also hopes to create Greenfield airport complex with 40 million passenger handling capacity in Chennai at the cost of Rs 20,000 crore besides upgrading existing Coimbatore, Tiruchy and Madurai airports to world class standard and augmenting their passenger handling capacity by 10 million passengers each. Ms Jayalalithaa also proposed enhancement of 2,000km of roads into six and eight lane Expressway corridors between Chennai and major towns at an estimated investment of Rs 40,000 crore apart from another Rs 50,000 for modernizing the state highways covering 5,000 km of four-lane highways and conversion of other state highways and other highways of 16,000km length to two lane roads with paved shoulders. Similarly, the state government proposes to develop Chennai into a megapolis at a cost of Rs 50,000 crore and a like sum for the rest of the state. The government also plans to develop 10 world-class cities in TN at a rate of Rs 10,000 crore per city.